You are here: Home / Buying & Selling Strategies / Real Estate Buying Advice / Commercial Property Buying Tips / ‘Steering Clear of ADA Drive-By Lawsuits’: Three Tips For Better Managing ADA-Related Risk. When I defend Virginia property owners in lawsuits involving the Americans with Disabilities Act (ADA), certain plaintiffs greet me warmly as I walk up to depose them. Why? Because we have seen each other so many times we are now on a first-name basis. One plaintiff in particular has filed around 50 ADA lawsuits in Virginia alone. Regardless of where you come down on the issue of ADA lawsuits, the reality is that the commercial property sector simply cannot ignore the risk they represent. 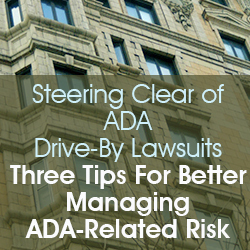 Below are three tips with the potential to strengthen your ADA risk-management strategy. No. 1: Engage in a process that demonstrates good faith. In reality, the situation is far more nuanced than that. If your building includes an old store with narrow aisles, your tenant would be unwise to say to a disabled patron, “Sorry. We cannot serve you. It would be too expensive to widen our aisles.” To be sure, your expert witness might explain the age of the building and note that knocking out aisles would reduce the amount of merchandise for sale. But while that might sound like a compelling argument, the plaintiff’s bar would likely counter with a punchier retort: “What else have you done to make your building accessible to the disabled?” If your answer is “Nothing, actually,” the plaintiff’s lawyer will surely pounce: “You couldn’t ask your tenant to put up a sign explaining that people in wheelchairs could ring a bell for assistance if they needed it? Neither you nor your tenant cared enough to put policies and procedures in place to help people with disabilities, given the architectural constraints of the building?” If the plaintiff can show you never took ADA seriously, watch out. Remember, when it comes to ADA, process counts. Did you go through a process in which you sincerely tried to comply with the act, given your constraints? Do not just assume an architectural change or equipment purchase will be too expensive. Do the research and document what you learn. If the accommodation is not readily achievable, work with counsel to see what else you can do to engage in a good-faith process. Be able to show your clear intent to maximize ADA compliance. It is simply impossible for serial ADA litigants to visit and inspect all of the millions of commercial properties in the United States. But what can make your business a likelier target is lack of “curb appeal” with respect to ADA compliance. Imagine an ADA plaintiff’s attorney cruising down a busy thoroughfare on the prowl for possible violators. What perception is your building creating? Is the parking lot full of cracks, with faded lines and weedy curbs? Is the sign over that handicapped space dented, rusted and hanging at a 45-degree angle? Is your wheelchair ramp rotting or in need of a new paint job? These are the types of visual cues that send a message to aggressive plaintiffs’ attorneys. They know that inattention on the outside means a greater possibility of ADA violations on the inside. By contrast, a spiffy appearance could potentially send the message that this property owner is savvy about ADA. The drive-by attorney might just drive on by. No. 3: Stay abreast of changing regulations. The ADA was originally passed in 1990, but rather than a static law, it is an ever-evolving set of regulations and guidelines. Commercial property owners need to stay abreast of ADA requirements as they evolve. For example, recent changes deal with everything from the height of x-ray exam tables, to the condition of lifts for the disabled at swimming pools accessible to the public. More broadly, regulators are intent, not just on providing access, but also on actively promoting it. It is one thing to keep a swimming pool lift in storage and haul it out with much fanfare whenever a person needs it. It is another to have a fixed, fully functional lift at the ready—one that does not require the assistance of a team of lifeguards for it to actually be used. And indeed, fixed lifts are one of the new ADA requirements. Regulators want people to be able to use lifts for both ingress and egress, by themselves. Another huge growth area for ADA—and one that is quite relevant for commercial building owners, managers and real estate agents—is the need to make sure their websites are accessible to the disabled. Can a user turn off that seizure-inducing strobe effect? Does your video have a closed-captioning option? Moving forward, building owners will need to work with counsel to stay abreast of changing ADA regulations, not just in the brick-and-mortar world, but also in cyberspace. Veteran ADA attorney Brian G. Muse is a partner in the Williamsburg, Va., office of national law firm LeClairRyan. 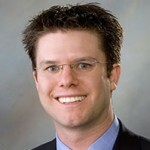 He blogs about ADA issues at ADAmusings.com. Brian.Muse@LeClairRyan.com.